When I was callow and new to London, I once arrived back on a train into Liverpool St Station after the last tube had gone and spent the night there waiting for the first tube next morning. With little money and unaware of the existence of night buses, I passed the long hours possessed by alternating fears of being abducted by a stranger or being arrested by the police for loitering. 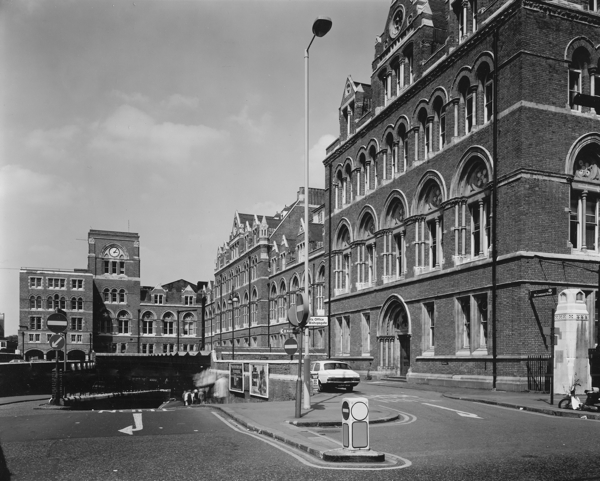 Liverpool St was quite a different place then, dark and sooty and diabolical – before it was rebuilt in 1990 to become the expansive glasshouse that we all know today – and I had such an intensely terrifying and exciting night then that I can remember it fondly now. 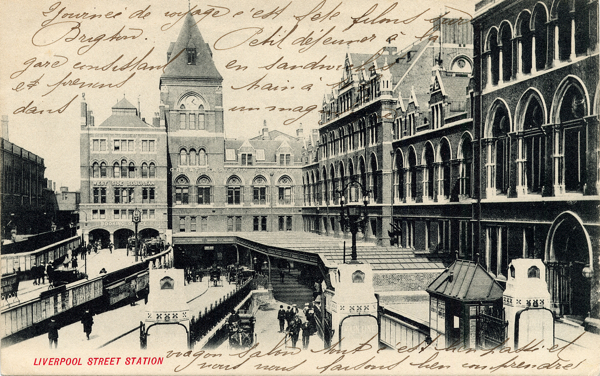 Old Liverpool St Station was both a labyrinth and the beast in the labyrinth too. There were so many tunnels twisting and turning that you felt you were entering the entrails of a monster and when you emerged onto the concourse it was as if you had arrived, like Jonah or Pinocchio, at the enormous ribbed belly. I was travelling back from spending Saturday night in Cromer and stopped off at Norwich to explore, visiting the castle and studying its collection of watercolours by John Sell Cotman. It was only on the slow stopping-train between Norwich and London on Sunday evening that I realised my mistake and sat anxiously checking my wristwatch at each station, hoping that I would make it back in time. When the train pulled in to Liverpool St, I ran down the platform to the tube entrance only to discover the gates shut, closed early on Sunday night. It was late August and I was in my Summer clothes, and although it had been warm that day, the night was cold and I was ill-equipped for it. If there was a waiting room, in my shameful fear I was too intimidated to enter. Instead, I sat shivering on a bench in my thin white clothes clutching my bag, wide-eyed and timid as a mouse – alone in the centre of the empty dark station and with a wide berth of vacant space around me, so that I could, at least, see any potential threat approaching. Dividing the station in two were huge ramps where postal lorries rattled up and down all night at great speed, driving right onto the platforms to deliver sacks of mail to the awaiting trains. In spite of the overarching vaulted roof, there was no sense of a single space as there is today, but rather a chaotic railway station criss-crossed by footbridges, extending beyond the corner of visibility with black arches receding indefinitely in the manner of Piranesi. The night passed without any threat, although when the dawn came I felt as relieved as if I had experienced a spiritual ordeal, comparable to a night in a haunted house in the scary films that I loved so much at that time. 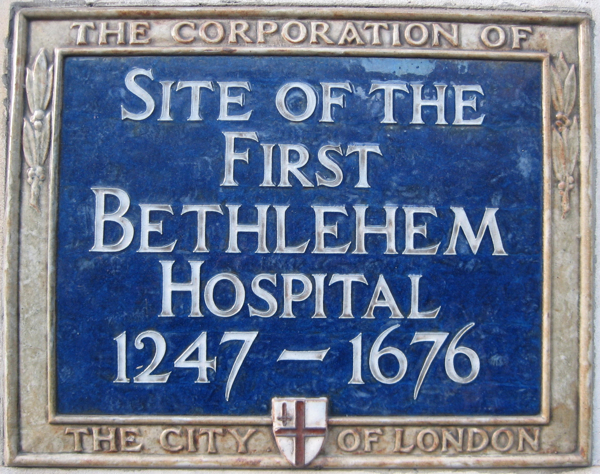 It was my own vulnerability as an out-of-towner versus the terror of the unknowable Babylonian city, yet – if I had known then what I knew now – I could simply have walked down to the Spitalfields Fruit & Vegetable Market and passed the night in one of the cafes there, safe in the nocturnal cocoon of market life. Guilty, and eager to preserve the secret of my foolish vigil, I took the first tube to the office in West London where I worked then and changed my clothes in a toilet cubicle, arriving at my desk hours before anyone else. 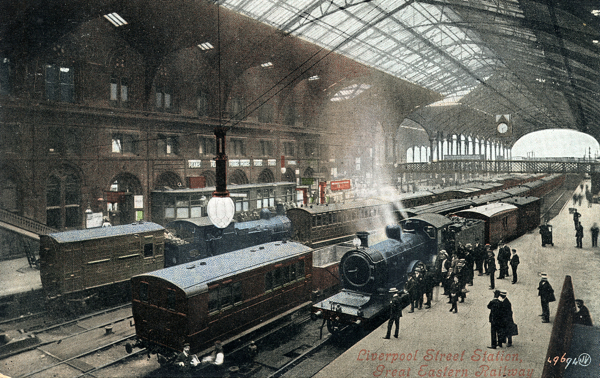 Only the vaulted roof and the Great Eastern Hotel were kept in the dramatic transformation that created the modern station, sandwiched between new developments, and the dark cathedral where I spent the night is gone. 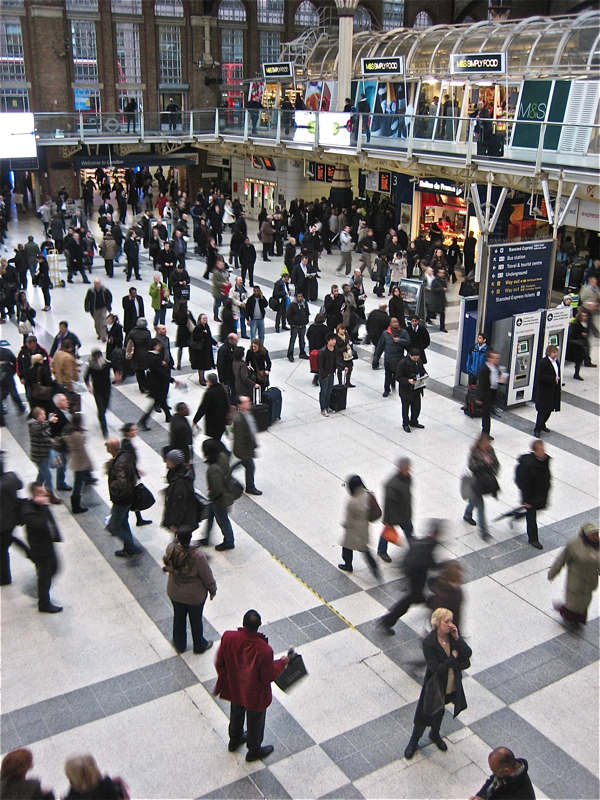 Yet a magnetism constantly draws me back to Liverpool St, not simply to walk through, but to spend time wondering at the epic drama of life in this vast terminus where a flooding current of humanity courses through twice a day – one of the great spectacles of our extraordinary metropolis. Shortly after my night on the station experience, I got a job at the Bishopsgate Institute - and Liverpool St and Spitalfields became familiar, accessed through the tunnels that extended beyond the station under the road, delivering me directly to my workplace. I noticed the other day that the entrance to the tunnel remains on the Spitalfields side of Bishopsgate, though bricked up now. And I wondered sentimentally, almost longingly, if I could get into it, could I emerge into the old Liverpool St Station, and visit the haunted memory of my own past? 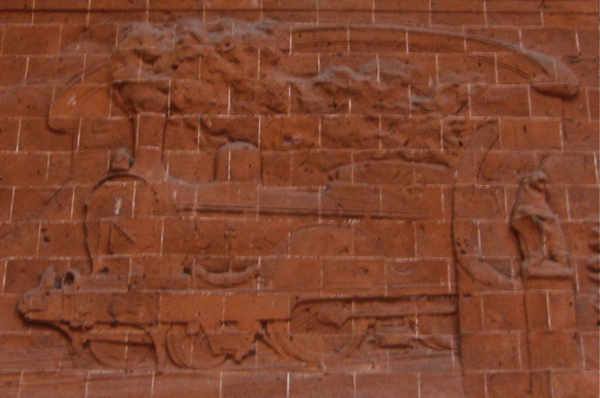 A brick relief of a steam train upon the rear of the Great Eastern Hotel. Ah… two of my favourite things: Liverpool Street station, and that feeling of anticipation as you approach it at the start of a London adventure, and Cotman’s sublime watercolours. You’ve set me up for the day. Thank you so much. Have you seen the flashmob dance advert for tmobile at Liverpool Street? This does stir up memories… I was a young girl back in the 80s when on a trip to the UK with my parents we went to London by train. 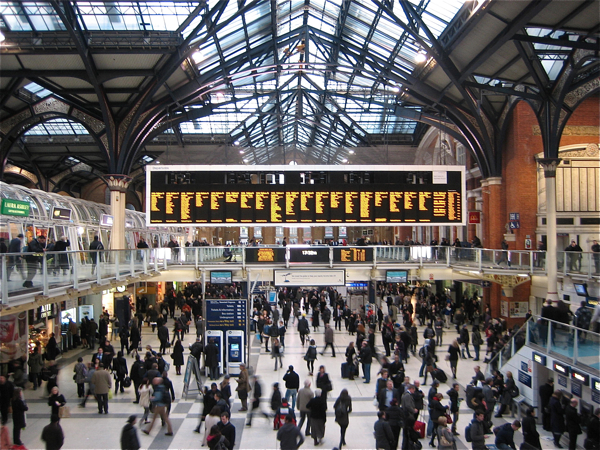 Liverpool St Station was my very first experience of London, and I’ll never forget how impressed I was. Thank you for yet another wonderful story. 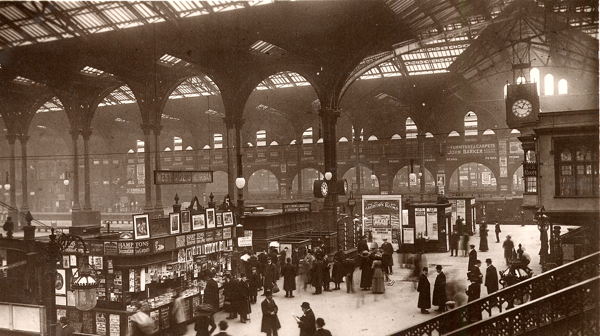 I enjoyed this account of Liverpool St Station then and now as it reminded me of my first impressions of the station. It was only a few years ago, so in its “new” form, but still it felt like a rabbit warren. Two Antipodeans arriving in London, via a sleepless week in the Big Apple, straight off the red-eye flight and heading for a friend’s house on Shoreditch High Street. We emerged bleary-eyed from the tube, weighed down with three months’ luggage, and I remember how lost I felt. We dragged all our gear up the stairs, past the fruit stall, up into the main station and then couldn’t work out which end was the exit to the main road (we didn’t even know to call it a “High Street” back then!) In the end, the thought of finding and catching a bus up to Shoreditch defeated us and we grabbed a black cab – a ridiculous luxury, it seems now. Like you, I then went on to work in the area and Liverpool St Station became as familiar to me as an old friend after many lunchtime runs to Boots or WH Smith. But every time I go there, I still remember that first day in London, that feeling of being overwhelmed, and I smile knowing how far I’ve come. I can’t even begin to tell you with what joyful anticipation I open your newsletter every morning. I come across your website while doing research for a lecture on ‘Secret London’ I gave recently here in Northern Germany.Finding your site was a big bonus. I am full of admiration for your consistent high standard of topic and style and for the marvellous photographs. 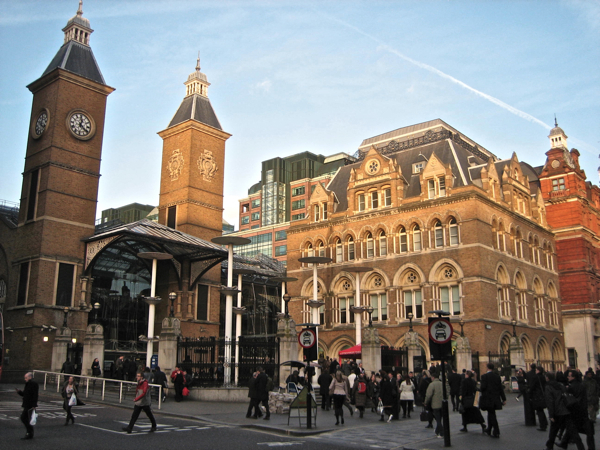 The article on Liverpool Street Station rang many bells because it was the port of entry for so many young girls from Europe who came to London in the 60′s as au pair girls. What you describe was their first overwhelming impression of London after arriving by ferry in Harwich, even if they did not have to spend an entire night at the station. 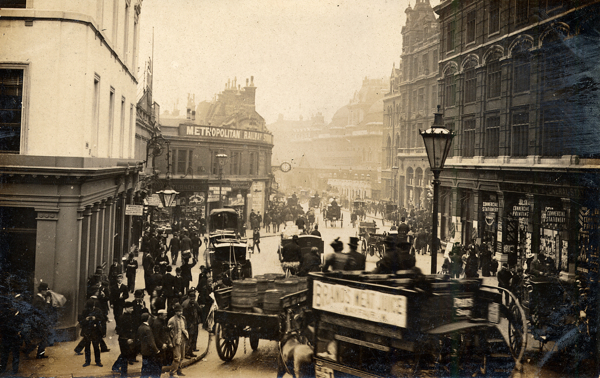 Great photos – and a great story of being stranded in Liverpool Street Station. I love safe adventures like that. Your blog is wonderful, by the way. In my dreams occasionally I’m wandering a huge dark and busy railway station, my platform lying somewhere distant over stairways and through holes in walls between the platforms. It probably is a echo of the old Liverpool Street Station that I knew in the 1970′s as a youth just starting his City career, and visiting his new girlfriend in Essex from time to time. It was indeed labyrinthine, the belly of the beast; but also romantic in its black, sooty grandeur! When I visit the UK now I sometimes use Liverpool Street tube to get to the Gun pub in Brushfield Street, for a meal with old friends in the pub’s upstairs timeless silver service restaurant (article please! ), and I’m afraid perceive a distinct lack of soul in the (now not so) new concourse of the railway station, whilst understanding that its cleanliness, efficiency and various boutiques are what is know as progress! Another lovely article, thank you. one of the yummiest exhibits EVAR, which brought my attention to the wonderful painting by caillebotte of the flaneur on the pont l’europe, staring down through the exciting modern metal struts at the gare st lazare. fantastic, and much in your spirit here. Reading your blog is like stepping out my door into London by some wondrous displacement of distance by desire. And when I want the journey to continue just a little longer, I read the Comments for a few extra side trips! I worked in the station in the 1970′s for about a year. Very happy memories. 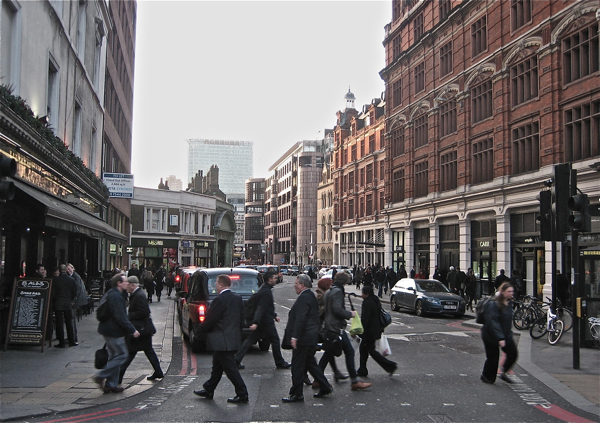 I spent time a few years ago at the Bishopsgate Institute researching Liverpool Street. My great-great-great grandparents managed a pub called the White Lion at 44 Liverpool street until sometime between 1869 and 1971, when I believe it was compulsorily purchased to build the station. Their youngest daughter secretly married, against their wishes a tailor called Adolphus Coni, working opposite . She must have been forgiven as my great-great-great grandmother went to live with them in old age! James Walker was also my Gt.Gt.Gt. Grandfather (publican at The White Lion). I am also researching the Cohni family. Incidently Mary Anne Walker did very well (financially)marrying Adolphus Cohni as he came to have a Tailors Shop in Saville Row, London. Somewhere along the way – you and I must be related. I hope you read this! apologies to the author for taking this thread off at a tangent but I am a Coni researching family history, and am descended from Charles, one of the children of Adolphus and Mary Ann(e); I believe the other children were Jules, Alfred, Frank, Florence, Augusta and Edith. (I would be happy for this website to pass my email address to you for contact). Diana, if you are the daughter of Clive and Doreen I would like to contact you in relation to your mother’s family. I left a message on your Facebook page, but it looks like you do not use that very much. Hope to hear from you. It is 2018 and I have only just revisited this thread.If possible could the webmaster pass on my email to Diana and Angela Quayle and allow me to have theirs so we can get in touch. 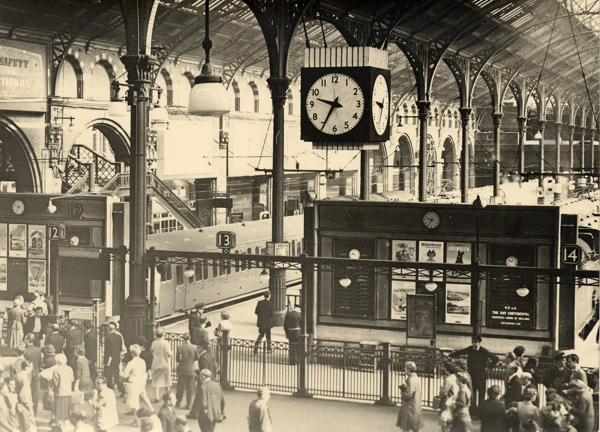 I was born in the late 50′s looking at some of the old photos brings back memories of how lovely the station used to be with all the great architecture we are now losing to these horrible greenhouse type station designs, they are just awful and have no “personality” or ambience. I never found it hard to find my way around these lovely old stations. The people were more polite unlike now everyone just pushing past people, no orderly queues, oh to bring all that back. Also see some of the old steam trains which I can just about recall seeing at around 2 years old and when I paid a visit to the Bluebell Steam Railway the minute I walked into the ticket office the old familiar smells were there and it was a step back in time to better days. 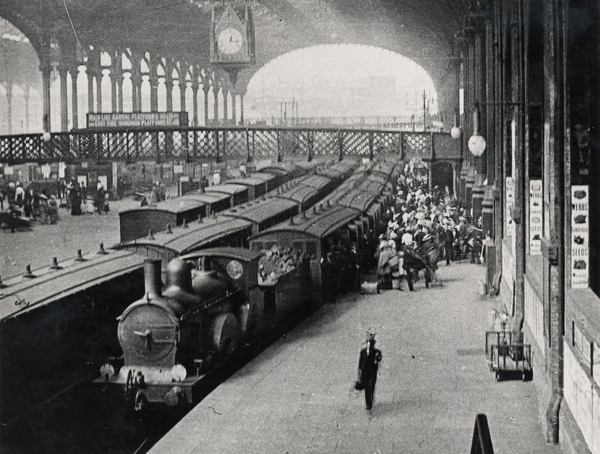 If you watch the Elephant Man film (John Hurt) parts were filmed in the old Liverpool Street Station.